Over the past couple of years, the U.S. economy has been on a rollercoaster of turbulent, unpredictable times. In 2008, a global recession attacked our markets. Due to a rising volatility from securitization of subprime mortgages, explosive inflation and an unhindered commodity boom, our nation was left dreaming of the glamorous days of growth that we experienced in the 90’s. However, despite the losses being published across headlines, our nation had one glimmer of hope left in its arsenal. That spark of optimism came in the form of the tech industry, with the internet as the motor that could propel start-ups, innovation, and progress. While many other sectors were falling apart at the seams, the technology industry retained its ability to report growth. But now, in what feels like mutiny from a democracy that has relied so much on the success of its tech figureheads, Congress has developed legislation that attempts to devalue its star player — a technology industry that has been a selfless contributor for freedom of speech, innovation, entrepreneurship and job creation. This triumvirate of Bills, known as the SOPA/E-PARASITE/PROTECT IP, are being discussed by the House of Representatives and the Senate and propose to pass censorship power of the internet to the entertainment industry. – Private companies have the power to shut down unauthorized sites where we download movies, music, and TV shows. – Government can force internet providers to block infringing domain names. The effect of this power could mean the deglobalization of the internet, as domains outside the U.S. border will almost exclusively be blocked. – Any personal blog, site or forum with a link to one of these infringing domain names is liable to legal action taken by the government. So what may have been a simple recommendation to a site that could have provided other users a benefit may actually cost you time in court. Even worse, offenders could face being blacklisted as an infringing site and forever be blocked from internet users across America. – Allows corporations and the government joint ability to cut any funds a site can earn by imposing that any payment service or advertiser cancel an account if they perceive a website to be infringing on these new laws. – Gives the power to large, already established corporations to sue any site that they feel is not filtering their content to match its standards. As a result, this will drastically inhibit new start-ups who could face becoming bankrupt due to overwhelming lawsuits from competitors. The crime lies in giving the power to corporations to eliminate almost all of their competition and stifle innovation as very few start-ups will be able to enter a competitive arena. However, the worst implication revolves around the ability of the government to limit our constitutional rights for freedom of speech and individual expression. Under this new legislation, the internet’s most beloved sites are now subject to the control of our government. Sites like Tumblr, Facebook, Youtube and Twitter have become our largest method of self-expression and are subject to the rigors of the government’s new censorship program. Sites where everyday users share opinions, news and daily activity are highly vulnerable because their users also often share videos, TV snippets and copyrighted music. For instance, as a very frequent Facebook user, I am constantly sharing videos of my favorite TV show moments. But according to these new censorship laws, Facebook is required to either censor me or risk being shut down for they are liable for anything that their users post. With the enacting of this legislation, individuals who even so much as post a video of themselves singing along to a Nicki Minaj song on YouTube could face up to 5 years in prison. This has caused some of the internet’s biggest players like Tumblr to fight back. 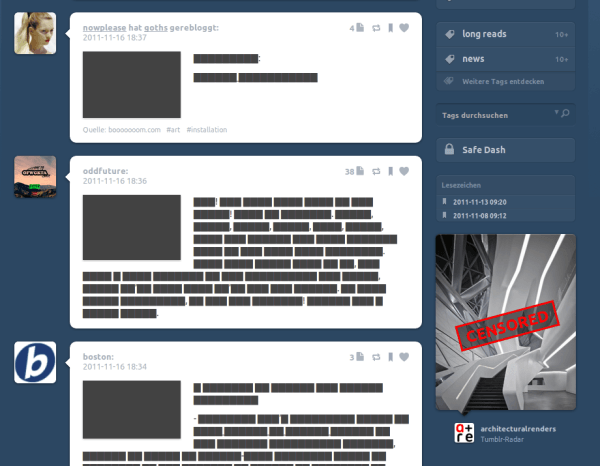 The blogging platform has replaced its user’s dashboards with censorship blocks and a link prompting it’s users to learn more about the law that could be censoring the internet. Other companies have actively opposed these bills by addressing the issue on their homepage. 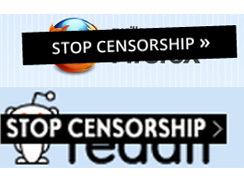 Among them is Reddit, an online community that largely relies on freedom of speech, and the renowned search engine, Firefox. Congress aims to pass a bill with a transparent goal of eliminating piracy on the internet to make consumers buy more movies and TV shows. Therefore, our government is showing favoritism towards an industry, ranked 51st most lucrative in 2008 by CNN, at the expense of its 2nd most profitable industry, Internet Services (CNN Money). With that in mind, can we rely on the government and private corporations not to abuse their power? Even if we can, other nations may adopt a similar approach to the internet and their governing bodies may not be as ethical in their decision against abuse of power. This domino effect would adversely affect the integrity of the internet, and the technology industry overall. As a recent graduate and an employee at a company composed almost entirely of Millennials, I have personally witnessed the value that the technology sector provides our economy, in providing growth, and a future for graduates, who face an otherwise bleak job market. The SOPA/E-PARASITE/PROTECT IP bills are fast-tracked to be approved by Senate for Christmas. Please help stop them by learning more about them at http://americancensorship.org/. Also, please do your part by spreading the word, and joining the cause. If you own a website, you can paste a small code on your site that helps people to write to congress. This legislation presents disastrous implications for our own personal freedom of expression and insinuates a halt of innovation. It could do permanent damage to the American dream of success that our nation was founded upon. Jay Gatsby would hardly approve. Please share your feelings by commenting, or if you’d like to continue the discussion, you can find me on Twitter at Shane Jones. Shane is Content Marketing Specialist for WebFX. Follow Shane on Google+.